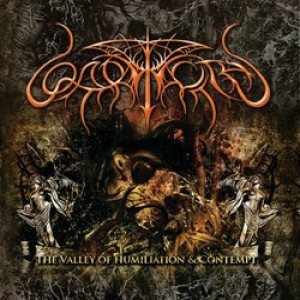 RANDOM: QHARINTH "The Valley Of Humiliation And Contempt"
Though this was released in 2010, I still think it is relevant to write a thing or two, especially when I finally managed to get a thorough listen of "The Valley Of Humiliation And Contempt". I have to mention the well produced nature of this EP, the band certainly did their best with it. And it is one of the better sound production to come from the often used underground Metal friendly I Seek Music Studio. The nice layout was done by a band member himself. And it's not hard to categorize the band's music too. QHARINTH can be described as atmospheric, symphonic black Metal and the main ingredients are the heads of HECATE ENTHRONED and DIMMU BORGIR. The first song (not accounting the short intro) is totally trademarked HECATE ENTHRONED, while the one that followed has DIMMU BORGIR in abundance. The rest are the mixes of both. While the influences are overbearingly obvious, the way QHARINTH managed to emulate them is worth applauding. The keyboards are well utilised and truthfully one of the main instruments in their compositions, and some guitar works are quite good too. A little strenghtening on some obvious sloppiness and they will surely become a great act, because "The Valley Of Humiliation And Contempt" is a worthy release, showing that touch of good song crafting ability.